Crime in unincorporated Central Stickney is down so much in the past couple of years, that it is part of a Cook County Sheriff’s Police district known as “the country club,” a prominent law enforcement official said Monday night. 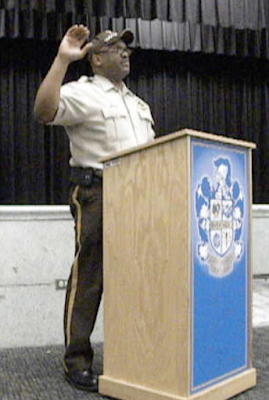 “We used to have a lot of issues with a few of the gang members over in our unincorporated area over in Central Stickney, but a lot of our gang teams and our patrol units dealt with a lot of cases and took a lot of the gang members off the streets, and they’re actually in the penitentiary now,” said Terrence L. Tabb, patrol commander of the Sheriff’s Police’s Bridgeview District, one of four districts across the county. He made his observations as an invited guest of the Garfield Ridge Neighborhood Watch, a citizen-led crime prevention organization that serves central and western Garfield Ridge (everything west of Central Avenue), at a meeting at Kennedy High School, 56th and Narragansett. About 50 Garfield Ridge residents—neighbors of Central Stickney--attended the meeting and applauded his remarks. Tabb did not offer any statistics to back up his assertions. 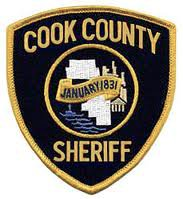 While the power of Sheriff’s Police includes everything in Cook County, the force’s primary mission is to patrol unincorporated areas of the county—areas like Central Stickney (essentially from 47th to 51st Streets, Laramie to Central) and Nottingham Park (the several-block area south of 71st Street and east of Harlem). Tabb said that the actions in high-crime neighborhoods in the city do not mean less Sheriff’s Police in unincorporated areas like Central Stickney, because “a lot of extra officers” are on duty on Tuesdays and Wednesdays. GRNW President Al Cacciottolo thanked Tabb for what he said was Sheriff’s Police successful efforts to rid Archer Avenue of drag racing and other speeding on Garfield Ridge’s main street. In response to a question, Tabb added that Garfield Ridge residents who see a crime in progress in Central Stickney should call 911 immediately and that the call will be routed to the appropriate dispatch unit. Non-emergency police calls relating to Central Stickney should be directed to (847) 635-1188, 24 hours a day. The line should also be used to report graffiti in Central Stickney, Nottingham Park or any other unincorporated area. The next GRNW meeting is set for 7 p.m. Monday, July 20 at Normandy Park, 6660 W. 52nd Street.